British Prime Minister Theresa May now has a cryptocurrency named after her, i.e. Theresa May Coin (MAY). Where did this Theresa May Coin come from? From first impression, it looks like a shitcoin, that is, a coin with no real value. There is an official website for it, and here’s what you will see if you enter the page. A very nice background picture with not much information at all. In fact, there’s only one blog post on it that explains what this P2P internet money is. It seems to be similar with Dogecoin and other similar coins in the market. These cryptocurrencies are all open source where anyone can take part in it. 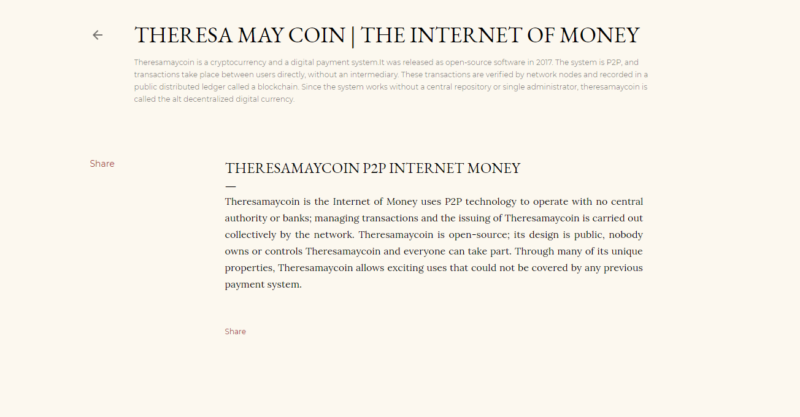 Personally, I don’t see any reason to adopt Theresa May Coin as a good cryptocurrency. Like 1,000 other coins, it probably doesn’t have a team that improves on the token. I mean, even terrible altcoins have a proper webpage where the developer actually takes the effort to share more information. The website itself speaks volumes of the coin. They only have links to other websites like Bitcoin Talk and Coinmarketcap. The Bitcoin Talk thread may actually be more active. At the time of writing, MAY is valued at only about USD 0.0025. As this token doesn’t really show potential, except maybe being funny, I would call it a shitcoin. There are over 1,500 altcoins at the moment, and a big majority are probably coins with no value or potential. Many of them are joke coins like this one. 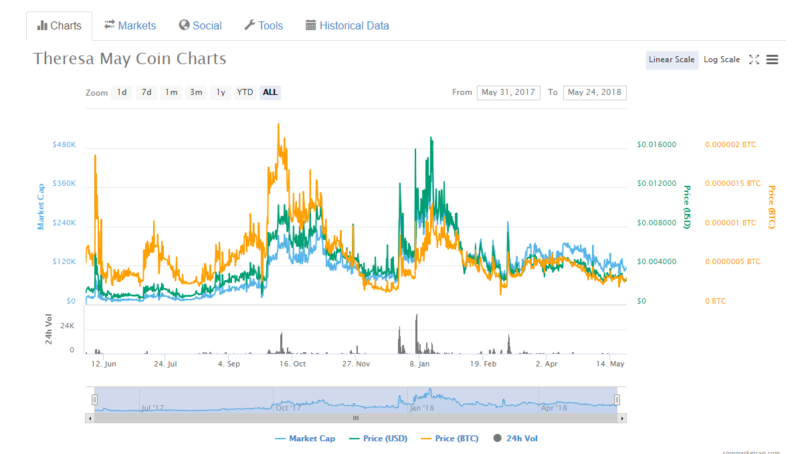 Dogecoin may be one of the more successful coins with no real potential. A really good coin would have a huge community and plenty of features that are ahead of other tokens. I normally look at scalability, transaction speed and the degree of decentralization in determining a coin’s worth. Of course, the team behind the token has to be legit as well. Disclaimer: All opinions and views that are expressed here are purely individual opinions. None of the articles are to be construed as giving financial or investment advice of any sort whatsoever.